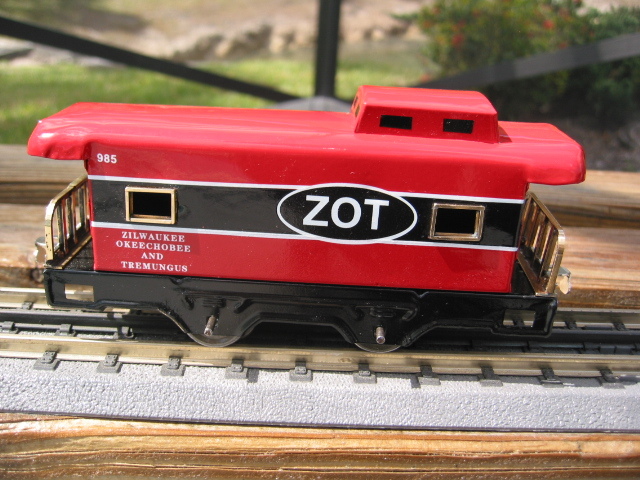 This page contains some large photos of 4 refurbished cabooses. This car was cleaned and repainted in the ZOT colors. Some of the trim pieces were originally brass-plated. That technology was not available for the refurbishment. car are now red on one end and green on the other. The original colors were red and white. 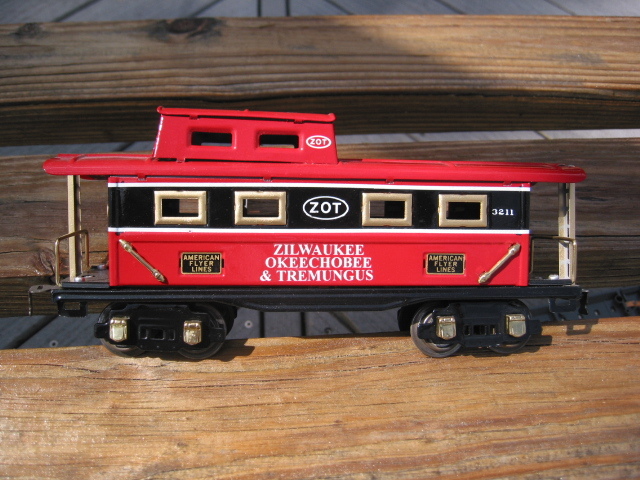 This car is a repainted American Flyer 1127, lithographed caboose. The car was in bad shape with rust, serious scrapes and missing couplers. The old finish was removed and the rust spots scraped and filled. I could not locte a source of replacement couplers for these cars. in the 1930's. I did find some shorter couplers that would mate OK. Here you see two of the large-sized, O-gauge cars from the same era. Here are the original and refurbished American Flyer 1127 cars. to dress it up a bit with the added detail. While not exactly tinplate, the project was in keeping with the rest. was the norm after A C Gilbert rebuilt American Flyer. This photo shows the comparison between an S-gauge car and a 3/16" O-gauge car. On the left is the American Flyer car. On the right is the car made by Marx. Some additional size comparison. Flyer S, Marx 3/16" and Flyer Litho O. This photo shows a comparison between three O-gauge cars. Flyer full-sized, Marx 3/16" and Flyer Litho O.